I created and launched my first online course, Phone Photography Primer, this past summer, and it was an effort years in the making. I’m a pretty technically savvy person, so it wasn’t the actual making of the course that was the most challenging part of learning how to create an E-Course. My biggest hurdle was overcoming my inner critic. I am going to cover the technical aspects of creating an E-Course here for you, but I’m also going to sprinkle in anecdotes/ resources/tips from my own journey to launch day. Because creative entrepreneurship is about 50-50 inner vs. outer work. And I know I kick myself when I can’t just simply follow someone else’s step-by-step guide. It’s the inner work that so often prevents me from putting it into action for myself. Guilt ain’t your friend when you’re trying to create something and share it with the world, mm-kay? Course income is the clear difference that separates the blogging middle class from the blogging upper class. There wasn’t one blogger who was not making a significant amount of money from an E-Course. Creating a signature course is your biggest opportunity for scalable income growth as a blogger. Read the full 2018 Blog Income Report Research Study by The Blog Millionaire here. As a single mama and online entrepreneur, creating a sustainable business model to provide for my kids and create a life I love is a huge motivating factor. Let’s move on to the beginning of my journey to course creation, shall we? Click here if you want to jump ahead to the technical goods and resources I used to create my course. 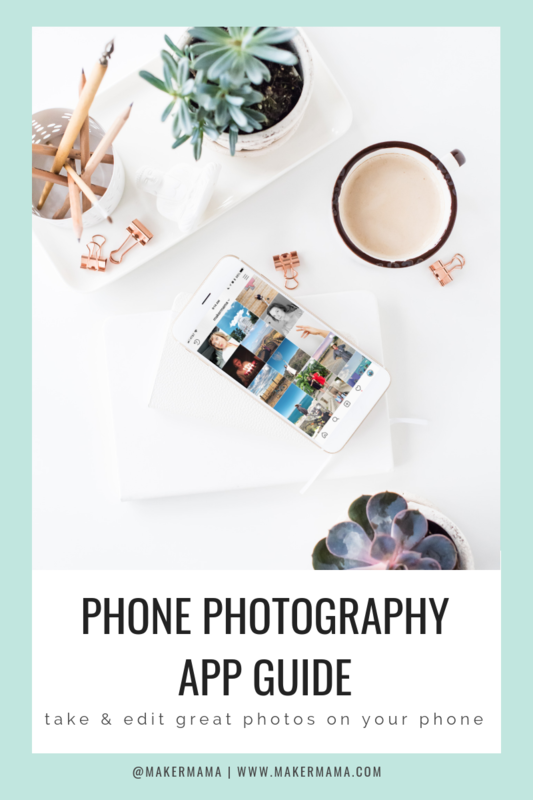 My journey to creating the Phone Photography Primer began about three years ago, when I was invited by a local school district to teach any course I wanted through their adult education program. 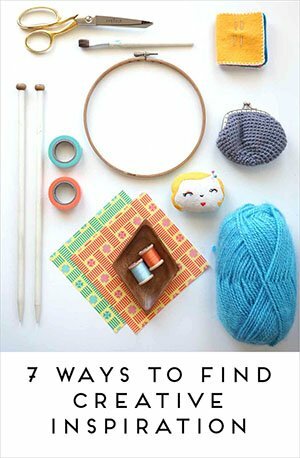 I threw out some crafting classes that didn’t end up sticking, along with workshops on thrifting and iPhone photography. I hadn’t really taught either of those subjects before, but both ended up being pretty popular. Pretty soon we were adding on additional classes for my iPhone photography workshops, and I began to find my stride in teaching groups of 20-30 people on taking photos with their phones. To create my initial course, I did some mind mapping and then plugged everything into an outline, and plugged the outline into a Keynote presentation. I pulled photo examples from my own mobile photography to illustrate the concepts and tips I covered, and figured out the logistics of connecting my phone to the projector to do live demos of my favorite apps in action. I took feedback from each course to fine-tune my teaching style and the content, and updated my course slides as needed. During the course of teaching through the school district a few times each semester, I was well into my journey as a divorced mom and had returned to working full-time. In the spring of 2017, after about a year of working back in the 9-5 world, I was faced with the difficult decision of staying in a work environment I was unhappy with or jumping into the great unknown of full-time entrepreneurship. I knew that I wanted to return to the freedom of working on my own and having the flexibility to be with my kids more. The idea of staying at my job felt like a false sense of security. And I’d been telling myself I should start teaching my phone photography workshop outside of the school district, as well as turn it into an online course. So I pumped myself up (with the help of some incredible friends) to make the leap. I gave my two weeks, made plans to host my first solo workshop, and told the world I was taking on client work. Even though I’d been working as a blogger since 2009, creating sponsored content and paid guest posts here and there, I’d never made a sustainable income for myself. And teaching at the school district, all I had to do was show up to teach my class. I secured a location for my first solo-planned workshop for a few weeks after quitting, paid the rental fee, bought event insurance and a fancy-schmancy projector, and began blasting it on the socials. I think I had *maybe* three people show up (and I’m pretty sure one of those people was my sister––thank you, Renee!). I learned pretty quickly how difficult it was to get people to show up for a paid workshop that I also had overhead costs for. This only solidified the idea that creating an E-Course would be a better way to go. I did teach a couple private phone photography workshops, and also began teaching trainees for a local yoga studio (love you, too, Mobile Om!) which has proven to be a great partnership for live workshops. My client work has also been much more successful and started pouring in the first day I put myself out there (hello 8 years of blogging and social proof on social media!). I’ve always been one to soak up knowledge from from other digital entrepreneurs, and it’s played a big role in me finding the courage and know-how to take my own leaps. 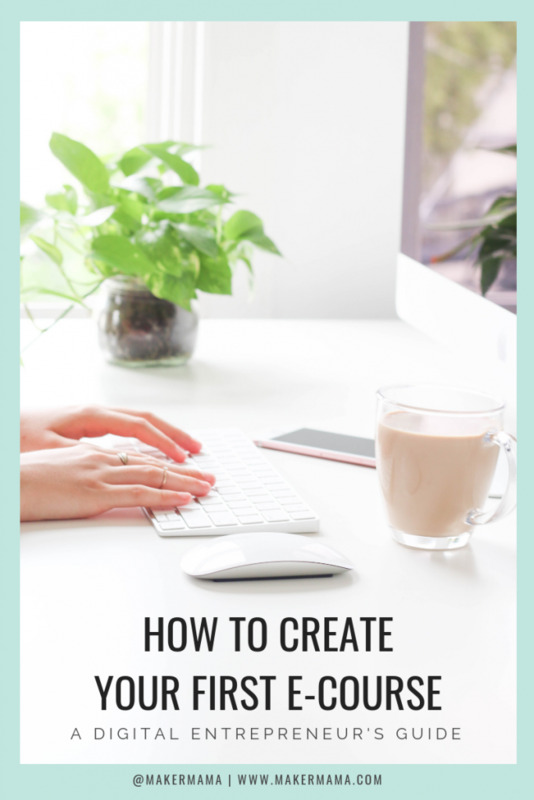 As I was working away navigating the newness of managing client work, I continued to surround myself with positive influences bolstering my goal of creating an E-Course. Enter Melyssa Griffin and her Blog to Biz Hive course. I originally found Melyssa via Pinterest (she’s a queen of content creation). And I came to really appreciate her insights and take on business when she launched her podcast, Pursuit with Purpose, in June 2017. Soon after, her Blog to Biz Hive opened for enrollment and I bit the bullet and bought the course, thinking that making this investment in myself would be the motivator I needed to make the jump myself. The course was packed full of valuable information. And we even got paired up with online accountability partners (I ended up with a few in the end). Over the course of several months I soaked up the course work and worked with the accountability group. But I was really stuck in not having a framework to really make this change for myself. I was full of info and knew the value of creating a course, but I was also full of doubts and hesitation, and ultimately I wasn’t taking the action I needed to to get the job done. And I was stuck living with guilt, which really wasn’t serving me. *To give myself some credit, I did begin my weekly Facebook Live videos covering phone photography and digital tips which has really served in building my audience and rapport while working with my accountability group. Earlier this spring, I got connected with the woman who became my life coach. I’d heard great things about her from a number of fellow entrepreneurs working out of my coworking space, and decided to set up an initial consultation with her. I knew that if I were to do coaching, I would want to work on getting my online course off the ground. During that initial consult we got to know one another, talked about what areas in my life I wanted to work on, and how working with her as a coach would fit into that all. I signed up to work with her shortly after, and we began digging deeper into my goals, mapping out plans for how I could achieve them, and clearly envisioning what achieving those goals would look like, too. There were numerous inner hurdles I had to face along the way. And they all really just boil down to fear. Fear of vulnerability in putting myself out into the world, into my business in ways that stretched me beyond my comfort zone. Procrastination is a big self-survival mechanism I use to ameliorate my fears, so to challenge that, my coach encouraged me to set a solid date for my course launch––and to share it with the world. So in June, I gave myself the launch date of August 22, and worked backwards from that date, laying out my plan for reaching that goal. Declaring a date was scary, but it was the impetus I needed to make it happen. Once I had my launch date it was time to get to work. Although I wasn’t working completely from scratch (I was building off of the in-person workshop I was already teaching), transferring it into an online course and launching it was a huge undertaking. And I gave myself about 60 days to do it––and it was summer so my kids weren’t in school, either. This was my first time attempting something like this so there was a bit of trial and error in mapping out my game plan. I started by creating a master task list of all the things I could foresee that needed doing. I also created a master list for the course itself––breaking it into an outline, defining what slides and graphics I needed, which slides needed screen recordings to go with them, etc. Then I broke them down week by week, anticipating when I would need to get each thing done. I soon realized that I needed this to be a flexible game plan. Life happens, you realize you left something off of the list, or––like me––you get overwhelmed with ALL of the things and get stuck in following the list to a tee, bogging yourself down with guilt instead of breaking out of the shoulds and into the coulds. This is also where having a coach was really great, because I got to check in every week to talk about my progress––and my challenges. One big challenge I faced during this process was that I was simultaneously creating the course and marketing it at the same time. Which was not ideal at all. My main goal with this first launch was to get the course made. Any sales I made this first round of open enrollment were just a cherry on top. That may not have been the best take on launching my first big online product, but that’s the perspective that helped me get through the labor and delivery of it. Okay, for those of you who’ve been patient enough read on, let’s get to some of the tools and technical goods of actually creating my course. Like I said, I already had the outline and knew what I was going to talk about in my course, I was just transferring it into an online video course that students could access and go through at their own pace. I decided to host my course on the Teachable course platform. Both Melyssa Griffin (the creator of the meta-course I purchased), and passive income guru, Pat Flynn, recommend Teachable (and use it themselves), so I knew I was in good hands. There’s not a right or wrong E-course platform, but I really enjoyed the experience of taking courses on Teachable myself. Teachable pricing is also very reasonable, and when you offer a free course to your students, you don’t pay any additional enrollment fees. Google Drive – Before I dived into making my course, I first created spreadsheets both outlining all of the tasks I needed to do on a timeline, as well as an outline of the course so I could track the creation and recording of it all. Google Drive is my go-to place for project management. DIY Course Creator Templates from Melyssa Griffin – This came as a bonus to her Blog to Biz Hive course and was extremely helpful in streamlining the creation of my own course slides. I plugged in my own colors, graphics, logo, and a few other extras that were pertinent. Keynote – I’m a Mac user, and Keynote is a free software program from Apple for creating presentations. Side note: I opted to create my course as a recording of a presentation rather than having me on camera. This made it exponentially easier to record my course––I didn’t have to worry about lighting, etc., and could record anytime day or night just talking through the course. Quicktime – Quicktime is a media player used to both watch and record video on your computer. I use it for its recording capabilities weekly. For my course, I used it to record my phone screen captures (which I then superimposed the mobile recordings onto my slides), and then I used it again to screen record my course slides as I talked through them. If you’re interested in a detailed technical how-to on this process, let me know in the comments. I’m thinking about putting together a mini-course on this. Canva – Canva is a great online resource for graphic design. I use it for all of my blog and social graphics, and used it for creating graphic resources and graphics promoting the course, too. 1. Created a spreadsheet of my course outline and a reverse timeline of all of my tasks leading up to launch in Google Sheets. 2. Created course slides in Keynote. 3. Recorded phone screen captures, then superimposed those videos onto my course slides. 4. Recorded the voice overlay with my course slides using Quicktime. 5. Created supporting pdfs, etc. using Canva. 6. Uploaded videos and supporting resources to Teachable. Like I mentioned earlier, I was simultaneously wrapping up course creation and mapping out my marketing plan as I prepared for launch. Ideally, I would have the completed course and then worked on the marketing afterwards, with plenty of time leading up to launch. But I was aiming to complete and launch the course in 60 days, so I was on a bit of a time crunch. Melyssa Griffin’s Sales Page Guide & Email Launch Sequence. – These are two resources within her Blog to Biz Hive course that I found to be extremely valuable. I’d never created a sales page before, and it was great to have templates to work from. I also mapped out my emails with Melyssa’s tips. I hadn’t fully taken advantage of email marketing and list building beforehand, and this was a good initiation. Lean Canvas – This was a tool that I was introduced to by my business coach, and it really helped me identify my audience and the solution I was providing them. I highly recommend it for anyone fleshing out a business or product idea. My Lean Canvas became a source for a lot of the language I was using on my sales page, too. A talented videographer – I’m fortunate enough to have an incredible friend who donated their time to help create a promo video that I used for advertising my course across social. Judy Campa is seriously gifted (and SO needs to market her services), and her wife Vanessa of Vanessa Velazquez Photography helped provide a photographer’s eye to our shoots, as well. Their high quality work really helped to elevate the promotion of my course. Facebook & Instagram – I did most of my advertising of the course through content marketing and ad buys on these two social platforms. I used both the promo video and my FB Live videos leading up to launch day (and during the enrollment period) to promote the course. And I used my experience with managing client social ads to run my own. In doing my project design with my life coach, a big part of accomplishing the goal of creating and launching my course was envisioning Launch day. From what I would be wearing, to everything I would do that day, I created a clear picture of what I wanted to do, feel, and how I wanted to be that day. 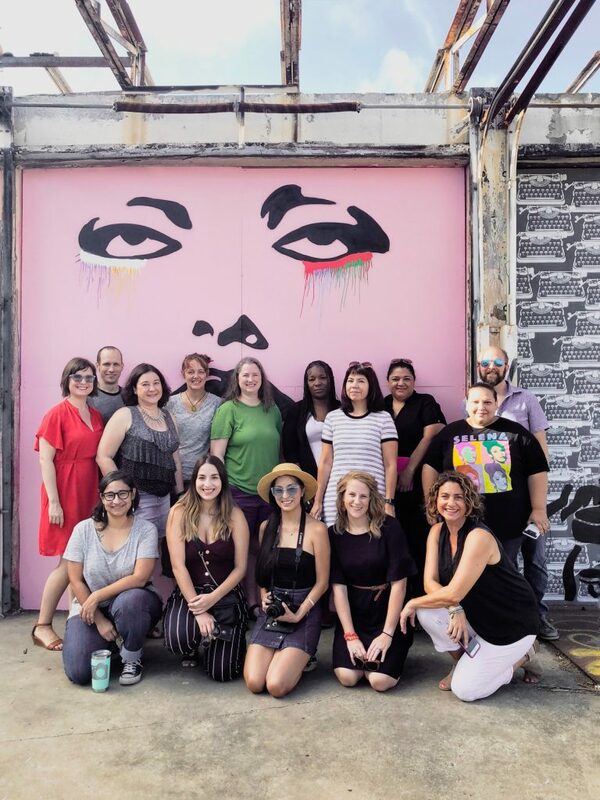 This process was about aligning myself with what I want to create in my business, and as part of that I envisioned a day where I surrounded myself with support and stocked up on self-love. I planned a phone photography meetup at Essex Modern City (a beautiful outdoor space with incredible street art), a celebratory lunch and drinks with my business bestie, a massage at my favorite spa, then picking up my kids and celebrating with them over dinner. I also bought myself a new red dress to flow through my day in. And I had all of my emails and socials planned out for the day ahead of time. The meetup that morning with local fans and friends was probably one of the best things I could do for myself and the launch. Not only did it get me out of my head (it would not have been good staring at my computer all day anxious over sales), but it also helped me do what I love most––connect with people. I promoted the meetup via Facebook leading up to Launch day, and that and the live social coverage that participants shared online was a great additional way to establish myself and my course both online and in real life. And it really just brought me back to the heart of what I love about teaching––seeing the aha moments in person. For the initial launch, I also put a time limit on enrollment. I left it open for a week, with the idea that the sense of urgency would lead people to buy instead of wait. I didn’t get quite the results I was looking for in initial registrations, but it wasn’t a complete flop. And, as I’ve been building up to relaunch, I’ve already had people asking about when it will open up again. I’ve debated over whether I’ll leave the course open at all times. I’ve heard good things about doing it both ways––it’s all one exciting experiment! And the good thing is now that I’ve created the course, it’s not something I have to keep creating––although I will be making updates and tweaking the marketing for it. In addition to planning out a Launch Day full of fun, I also planned a solo road trip out to Marfa to commemorate my achievement. As an entrepreneur it can be easy to cross each hurdle without pausing to appreciate your accomplishments. The ‘finish line’ always moves in life and work, but it’s imperative to recognize the big moments so we can look back and remember them when the going gets tough. That trip was a great break after working so hard, and it gave me time to really reconnect with myself after putting so much of myself out into the world. 1. NOT market and create the course simultaneously – This was probably the biggest challenge I faced in creating and launching the course. Not having it all completed made it a little challenging to market it, but fortunately I knew all the content I was putting into the course. So it wasn’t as hard as if I was starting from scratch. It did make time a big pressure point. Between mom-ing and balancing client work, adding on a big course creation and launch made it a pretty big work load. 2. Have a mapped out sales funnel in place – The concept of sales funnels and super laid out business plans have always been somewhat intimidating to me. I’ve grown my brand organically, and strategic planning is a skill I’m still building. Having some semblance of a customer path outlined is definitely something I’d recommend. 3. Create a marketing timeline, too – This goes hand-in-hand with the sales funnel. But creating a timeline for every piece of your marketing versus sending things out on a whim is another recommendation. I was somewhat successful in building this out for myself, but something I’m working on improving for relaunch. And by marketing I don’t just mean your social media posts, but also content marketing (blog posts, videos), emails, and ad buys, too. 4. Have the course transcribed – One thing I’ve really appreciated when I’ve bought online courses is having the option to read the transcripts of the videos instead of just watching them. Teachable makes it really easy to upload pdfs to compliment each section of your course, and this is something that can be easily added (and something you can repurpose for ebook format, too). 5. NOT offer a Facebook group – I know this is antithetical to a lot of what I hear in online marketing right now. Some of my favorite internet marketing gurus swear by Facebook groups. But for me, it just didn’t jive in the end. I know I myself am in numerous Facebook groups, and in the end I’m just not able to be super active in them. I’d rather connect with people in real life and through the content I’m already creating online, not force myself to feel like I have to create more exclusive value to beef up the value of my course. 6. Rethink my course pricing – I started off with a pretty high price tag for my course with the idea that people would inherently see the value of what I was offering. There are a number of factors why my course didn’t sell more during my initial launch (i.e. I definitely could have had a bigger email list), and I think price point was likely one of them. Not that my course wasn’t as valuable as I thought it was. But as I’m still growing my audience, I need to let the cost of my products reflect that. Once I’ve really begun gaining the trust of my followers with the products I offer, then I can expand my pricing. 1. Give my self a launch date and announce it online – This is probably the biggest reason I was able to get the course completed and launched. Instilling outside accountability inherently made me want to keep my word. Sometimes it can be hard to keep our word to ourselves alone. Isn’t it awful that we tend to put ourselves last? And maybe no one online would have really noticed if I let the ball drop. But announcing my intentions online made me want to keep my word more than if I had just quietly written it in my planner. 2. Create a master task list & timeline – Having the intention to do something doesn’t mean that you’re automatically going to put it into action and achieve it. Creating a roadmap for myself outlining all the tasks I needed to do, and then plugging them into a timeline for myself helped me to put my actions where my mouth was. Checking in on your task list/timeline is crucial for creating action, too. Lisa Cogdon’s Workflow, Time Management and Productivity for Creatives course is a tool that has proved exponentially valuable as I plan out my projects and work load. 3. Use Teachable – I’m really happy with my experiencing hosting my course through Teachable. I love both the interface for users and the backend for course creators. They also take care of all of the sales taxes on their end (you can set up your own payment system if you choose). I also like that my course isn’t presented in a platform in a sea of courses. I have my own landing page right within Teachable that I can direct people to, without the distraction of other competing courses. 4. Have a launch day gathering – Again, connecting with people off screen and in person on launch day is a huge morale boost. This next time around I’m hosting a free local workshop rather than just a photo meetup. I quickly realized on my first launch day that everyone was hoping for some photo-taking tips––which I shared on the fly. 5. Celebrate the launch! – I may not take a 5-day road trip each time I launch a course or product, but commemorating my achievement with some sort of celebration is important. I hope this gave you some valuable insight into the creation of my first online course. I’d love to hear what stood out to you the most about this guide––leave me a comment! 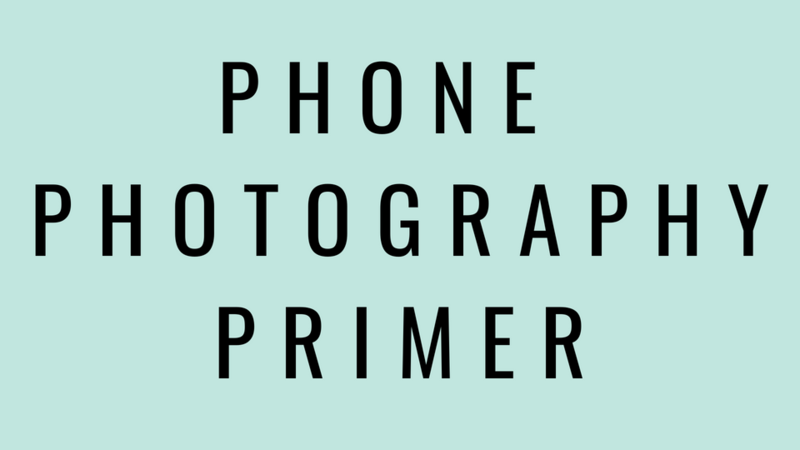 You can learn more about the Phone Photography Primer course here if you’re interested in taking better photos for yourself. And I’m certainly planning more courses for the future!